Every year, the American Hosta Growers Association selects one Hosta variety, which must meet certain requirements and then honors it with the title ‘Hosta of the Year’. This year, ‘Lakeside Paisley Print’ is the chosen Hosta. It produces heart shaped leaves with very wide, wavy green margins. The centre of the leaves is a cream colour feathery pattern. 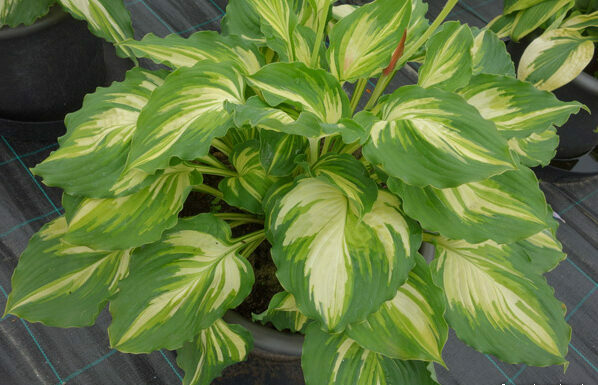 This Hosta grows about 10 inches tall and 20 inches wide and performs best in full shade to part sun. You can find me outside in the perennial gallons.